We are super thrilled to announce the launch of our brand new website, all shiny and sparkling, ready to take on the world wide web! With lots of new exciting features and a crisp, modernistic design, our new website is ready to go. If you love web design and are always on the look out for something fresh in the digital marketing world, then the new CueBlocks website is definitely something you should check out! At CueBlocks, we love creating incredible new things and designs that are up-to-date with everything going on the in the Digital World. Our team of creative designers has toiled over the new CueBlocks’ web design for quite some time, making sure that even the smallest of details are well thought out and reflect the amazing talent that CueBlocks houses. The result: an elegant, user-friendly website that is a delight to look at and to browse! 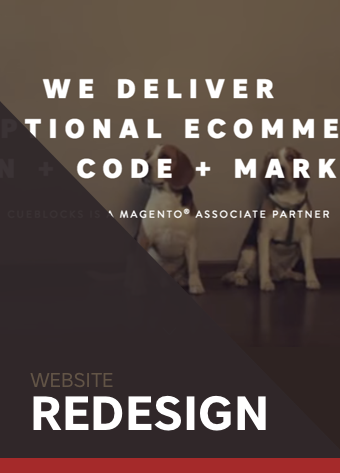 CueBlocks is an eCommerce Digital Agency that specializes in Magento Development and in Conversion Oriented Digital Marketing Services. Take a look at the host of Development and Digital Marketing Services that we offer, and if you like what you see, Contact us! P.S – CueBlocks is also a Magento 2 Trained Solution partner and is now qualified to help you take the Big Leap to Magento 2! 🙂 Find out more here. Hello world! This is me, a copywriter, a PPC specialist, and an Army Brat who simply cannot sustain without some edginess, fun, and learning. I like fashion, spending on fashion, and experimenting with clothing! And when all of this is sorted, I like to travel & explore the world!